Tie up next to Roman Abramovich’s superyacht in Port Vauban, home to some of the most grandiose boats in the South of France. This historic town is known for its winding cobblestone streets, fine restaurants, and vibrant club scene. Situated between Cannes and Nice, it’s an excellent starting point for your pampered yacht charter. 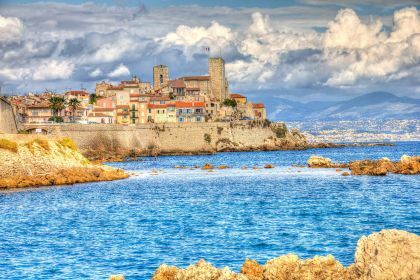 Give us a call or contact us here and allow one of our friendly charter brokers to arrange all the plans so you enjoy a perfect charter vacation in Antibes and Cote D’Azur. Yachting means different things to different people. But one common denominator is the desire for adventure while having access to comfort and class. Throw in a beautiful destination and paradise is made. 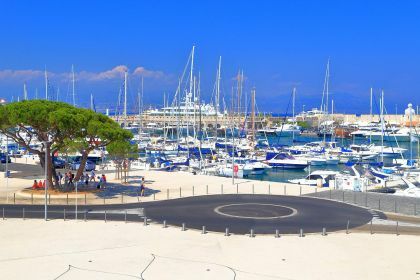 The historic town of Antibes is a perfect mix of charm, elegance, glamour and excitement. Its cobblestone streets, flower boxes, fine restaurants and vibrant club scene make it a must-visit Cote d’Azur spot. Take a stroll around its impressive 16th-century ramparts, browse the boutiques and artisan shops in Old Town or visit the Picasso Museum. Then don your slinkiest clothes and hit Le Whiski a GoGo, Le Village and Le Pam Pam nightclubs. In Antibes, you don’t have to venture far for good food as there is an excellent restaurant on almost every corner. Head to Michelin-starred Le Vauban, where seasonal ingredients are sourced from their own farm, and try their quail signature dish. Or go truly French and order a plateau de fromages. Another top eatery is Eden Roc, where you can dine on delicious seafood and desserts at a terrace table overlooking the bay. Also try Le Cesar, Le Pavillon, Le Pavillon Beach, La Taille de Guepe or Cap Riviera. Shopping in Antibes comes in two sizes: large and small. 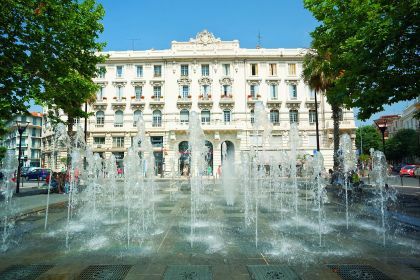 If you want large, take a half-hour drive to Cagnes-sur-Mer, where the enormous Polygone Riviera Shopping Centre offers 150 stores, international labels, local fashion talent, a luxury, cinemas and restaurants. Merely strolling through the centre, which is decorated with palm trees and sculptures, is thrilling. If you prefer a smaller, more intimate shopping experience, take a walk through the Old Town and Juan-les-Pins area, where boutiques and niche stores offer unusual finds. In between dining, clubbing, shopping and soaking up the town’s history and natural beauty, why not complete your vacation with an adrenaline activity? Azur Helicoptere will let you fly a helicopter, Diamond Diving will show you underwater secrets and Riviera Touring will set you up on a Harley and take you on a thrilling ride along cliff-edged roads. Better yet, cruise along the coast in your yacht and explore those hard-to-reach places landlubbers can only dream about. From the clear waters off the beach resort of Juan-les-Pins, marvel at how luxurious private mansions and swanky new developments merge seamlessly with the town’s historic buildings. The French Riviera must be seen, felt, heard and tasted – and what better way to experience all of this than on a luxury yacht? Give us a call or contact us here and allow one of our friendly charter brokers to arrange all the plans.